Benito Dusi grew up on the vineyard that he farms today just south of Paso Robles, California. He carefully tends Zinfandel vines grown in the traditional dry-farmed, head-pruned style that he learned from his father. We met Ben when we began planting our vineyard in 1997. He became our mentor, teaching us these traditional techniques to use at Condor’s Hope. We are very pleased to be one of the few small producers of wine from Benito Dusi’s old vine Zinfandel. Grown in Paso Robles and kept in American Oak barrels for over 20 months. Winemaker: J.P. Pawloski of River Run Vintners. This vintage produced in the third year of drought concentrates raspberry and cherry with the classic spicy Zin finish. With its traditional Old Vine complexity, this special wine will complement most meats and pasta dishes, but is extraordinarily best with anything chocolate. Second year of drought gives the intensity that comes with smaller fruit. The black cherry essence finishes with a cinnamon spice. Full-bodied and complex, this Zin will complement a very special meal and will linger through the dessert. Time will bring jam and complexity to this wine. 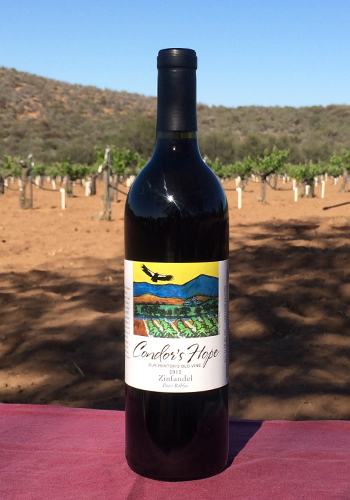 A drought year brought the fruit of black cherries forward in this excellent example of an old vine Zin. Full bodied and complex, this Zin will fill your mouth with smooth fruit and spice, with a hint of chocolate on the finish. 45 cases produced. The wisdom of the vines comes through in a full body and lingering richness. Expect raspberry jam, a complex structure, and pepper on the finish.